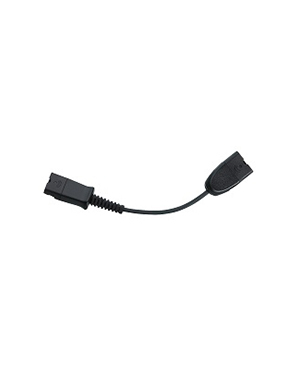 Plantronics 6 to 4 Pin Adapter Cable (DA70/80 to EncorePro Digital Headset) helps users to connect Plantronics DA70/80 Adapters to Plantronics EncorePro 500/700 Digital Series Headsets. This Adapter cable is a USB audio processor that is intelligent by design and improves the audio experience of users in each call, making it perfect for customer services centres and their demanding call handling and management needs. Plantronics 6 to 4 Pin Adapter Cable helps users to be able to meet OSHA and Noise at Work specifications by improving users’ audio experience through promoting exceptional audio quality. It is also compatible with Plantronics Manager Pro. If you need to have this product delivered, call us now at Australia wide 1300 131 133 and learn how to place your order! Established in the year 1961, Plantronics is a consumer electronics enterprise headquartered in Santa Cruz, California. Led by CEO and President Joe Burton, the company has been operating for decades now and has become the global leader in the market, producing and introducing wide selection of business and consumers audio communication products and solutions. Plantronics has its manufacturing and production operations located in China and Mexico. It operates in the global market with the help of approximately 5,000 employed experts. More than just employees, the company also has a lot of distributors, retailers, and partners in more than 80 countries all over the world. Plantronics had a humble beginning when two pilots decided that it is finally the time to have lightweight headsets in the crowd of big, heavy, and bulky headsets. The company introduced these lightweight headsets in the year 1962 and a mark in history in the year 1969 when Neil Armstrong used a Plantronics headset in his legendary mission. Headsetsonline Pty Ltd is an Australian online store that operates in Headsetsonline.com.au, which is the company’s site that showcases the entire product portfolio. This portfolio offers wide selection of brand new and refurbished corded and cordless headsets, Bluetooth headsets, gaming headsets, headphones, and speakerphones displayed in the site for customers’ access and checking out. Headsetsonline ensures that the site is well-secured and protected through its 2048-bit root encryption, 256-bit Identity Authentication, GeoTrust True Business ID with Extended Validation, and green URL address bar HTTPS. Headsetsonline has been a division of a popular enterprise that have the same product offers. It has compiled decades of experience since 1998 and has used the experiences and knowledge gathered from its operations to create a powerful product portfolio to cater to the market. This portfolio is comprised of Australian standards certified audio and sound products and solutions coupled with warranties that can be used by customers wherever they are in the country.